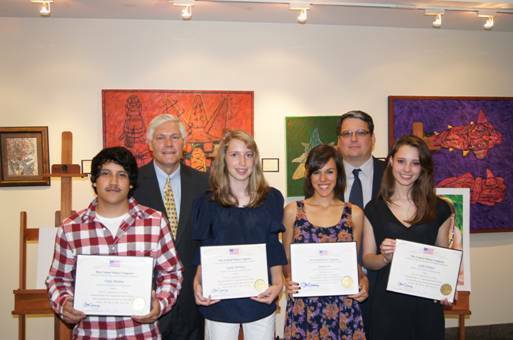 Congratulations to the winners of the 2012 Congressional High School Art Competition. The Congressional High School Art Competition, known as “An Artistic Discovery” is an annual, nationwide art competition initiated by Members of Congress in their respective districts. The competition is open to all high school students in each district. This annual competition provides an opportunity for local students to showcase their individual talents and receive national recognition. Sophie Anthony, a freshman at Booker T. Washington High School, was awarded the Grand Prize for her graphite and colored pencil piece entitled "Family.” Her artwork will be showcased in the corridor leading to the U.S. Capitol building for the next year. As the Grand Prize recipient, Sophie will travel to Washington, DC for the national Congressional High School Art Competition award ceremony in June. I am proud to congratulate Sophie on her artistic accomplishment, and I look forward to viewing her winning piece on my way into the Capitol each day. I am delighted that visitors from across the country and other Congressional members will be able to see firsthand the exceptional talent from the students of the 32nd Congressional District. This year’s competition included 40 entries from students representing five local schools and was once again sponsored by The Art Institute of Dallas. Prior to the awards ceremony, the Grand Prize winner and Runners Up honors were chosen by art instructors from The Art Institute and local artists. The People’s Choice Award winner was chosen by my constituents through online voting on his website. Runners Up honors were presented to Callie Walter, a sophomore at Highland Park High School, for her photo entitled “Angel” and to Fredy Medina, a sophomore at Booker T. Washington High School, for his pen sketch entitled “Medina.” The People’s Choice Award was presented to Jenna Caire, a senior at Richardson High School, for her acrylic piece entitled “Hiding From the Truth.” The two Runners Up and the People’s Choice Award artworks will be displayed in my office for the next year. Sophie, Callie, Fredy and Jenna used their imagination and artistic ability to produce award-winning art and I am very proud of their achievement. I also want to thank all of the student artists who participated in this year’s competition, and I wish them the very best as they continue their education and further develop their artistic abilities.